The Garrison Curling Club’s beginnings are rooted in the military. Its original Quonset style building, within Calgary’s Currie Barracks, served as a recreation facility for army personnel and some non-military members. The first structure, which opened in 1961, was said to originally be a portable weapons WWII training centre from Coal Creek, AB. Its founders, including some of today’s original members, worked hard to add improvements to the club such as a clubhouse and volunteer run lounge. In 1963, the Garrison Curling Club opened its doors to civilians and rental leagues. The junior program was then launched in 1967. In 1968, a Canadian “unification” program, led by Defence Minister Paul Hellyer, caused the rink to adopt an official name of the Canadian Forces Base (CFB) Calgary Curling Club. However, many members never stopped calling it the Garrison. In June of 1987, the club faced tragedy. A fire broke out and destroyed both the clubhouse and lounge. The event cut off 290 curlers’ season, with some contemplating whether or not they had to look for a new rink. The following year represented the club’s largest ever to-date recorded expenditure: rebuilding the club. 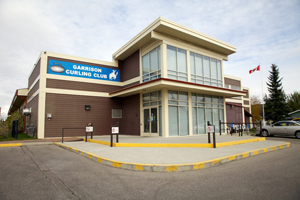 In 1988, the CFB Calgary Curling Club re-opened with 200 strong. Volunteers helped cut an estimated final bill of just over a million dollars. The rebuild allowed for further improvements and equipment such as kitchen upgrades, sound systems and an ice plant overhaul. It was even designed to be easily expandable for six sheets of ice. At the start of the 90s, the club was forced to borrow money from CFB Calgary, until the mid 90s, when it posted a healthy bank account surplus. The club’s success at this time was largely accredited to fundraising efforts. Between 1988 and 1997 the club was self-sufficient. It flourished within the city’s community and sported some headliner athletes. Curlers such as Paul Gowsell, Ron Northcott, George Fink, Frank Morissette, Wayne Sokolsky and Fred Britton played on Garrison ice. The late 90s is where the Garrison would reclaim its original name, it was also a time that begin another major shift in the club’s history. In 1996, a cited cost cutting federal budget called for the club’s land. The base closure was set for 1998, with a federal agency called the Canada Lands Company assigned to handle the real estate deals. The original negotiable terms seemed promising for the club to stay, but ultimately went south as the years proceeded. In 2000, after a long fought battle, the rink officially vacated. Not until 2003, was the club able to secure a new location, where the current 2004 completed building stands. a curling club.” Now with over 800 members, and mulitple rental leagues, this same sentiment continues to form the foundaton of the Garrison's culture.